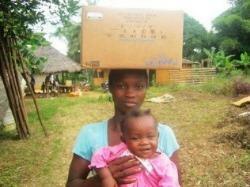 ECOL currently has 101 churches divided into 10 church districts in Liberia. The challenge of equipping pastors for the effective work of ministry can not be over-emphasized. 90% of the ECOL churches are located in rural parts of the country where there are very little or no biblical training facilities. Moreover, due to the 14-year civil war, many of our current rural pastors did not have the privillege of completing high school education and therefore do not have the academic requirement for a college education. Many adults who find themselves in this category now focus on the education of their children. Hence, most rural pastors have the passion but lack the knowledge. It is the responsibility of the Missions Committee to ensure that these pastors are trained enough for the effective work of ministry. The Committee under a project known as the Equipping Servants for Service (or Euip project for short) send trained pastors regularly to rural districts to conduct training seminars for pastors there. This project is funded by SIM and has been very successful with remarkable impacts. The ECOL missions committee raises funds for support for our local missionary program. Under this ministry, which was inaugurated in 2012, local missionaries are recruited and sent to rural areas of Liberia for evangelism and church planting, discipleship or to serve as pastors of newly planted churches. 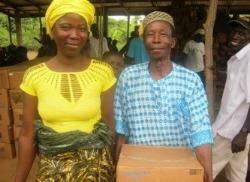 These local missionaries are supported by ECOL for the effective work of ministry. We have supported 4 local missionaries since 2012. Pastors Morris Barwon and Momo Senah were the first local missionaries under this new mission effort; there were sent to upper Kolahun district to disciple pastors of ECOL’s churches in the region. 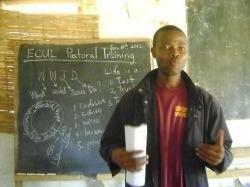 We sent and currently support Emmanuel Sackie in central Liberia for church planting work. 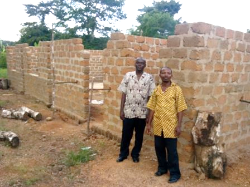 Emmanuel has started ECOL’s newest church in Gbarnga. We also sent Jallah Smith to disciple pastor in Kongba – a remote district. The current Ebola outbreak has brought a temporary halt to the program because of the high health risk to local missionaries. The missions committee also raises funds to assist local churches undertaking special projects such as church edifice construction, renovation of churches damaged during the war, agro projects, etc. Liberia currently has an unemployment rate of 85% due to our long civil war. Many of the members of ECOL churches are jobless so raising support for church ministry remains a challenge. The national leadership helps churches undertaking projects by raising extra support to enable them successfully finance their projects. Early this year, the missions team raised funds and donated 6 bundles of metal sheets To assist with the roofing of the Lofa Bridge Evangelical Church (shown above) in Cape Mount, western Liberia. 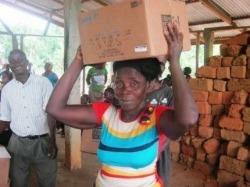 The committee is also involved in providing relief services where the need requires. Below are some photos from the ECOL relief food (Manna Pack rice) distribution (January 2014 in lower Grand Bassa County and Montserrado. 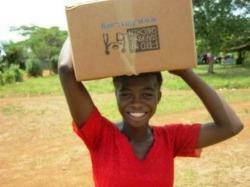 The food was donated by FMSC through EMAUSA. 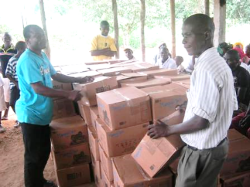 A total of 750 boxes of Manna Pack rice were distributed to three churches in the two regions namely: Faith Chapel, Gbeeyah Evangelical Church and Evangelical Christian Fellowship (ECF). The ECOL missions committee is currently raising funds for support to relatives of those who died of Ebola and for who were infected but survived.